Like so many of the wonderful things I enjoy in life, a chef buddy of mine turned me on to Tacos Jalisco a couple of years ago. I instantly fell in love. This is probably my favorite taqueria in Sarasota that serves very authentic Mexican food. I’ve written in the past how I enjoy chefs doing modern riffs on tacos, but I can assure you that these are as authentic as any being sold at this very moment on the streets of Mexico City. The owner and her husband take great pride in the food by making everything from scratch. My favorite component of the tacos here is the light, fluffy corn tortillas that have been made by hand. I’ve tried to replicate this recipe dozens of times at home, and I still haven’t figured out how she achieves the heavenly consistency. Like many traditional taquerias, other items are also offered on the menu, but the tacos are so addictive, that I keep coming back for my fix. I was thrilled to see that they offered barbecoa de borrego, or barbecued goat tacos on the menu. Barbecoa is a style of cooking that originated in the islands of the Caribbean with the Taino Indians. Our term that we affectionately refer to as “barbecue” is a derivitave of this term. Barbecue is one of those cooking methods that fascinate me, because it seems that all cultures, from all corners of the world have a form of it in their culinary culture. In Mexico, barbacoa is typically either roasted over an open fire, or prepared in a pit with the protein being covered with maguey leaves. At times, goat can be a little gamey, but the flavor of the filling that I wolfed down was delicate and mild. I’ve always been intrigued by tacos al pastor, or as they are also known in Mexico as “tacos arabes.” These tacos developed in central Mexico in the 1930’s with Lebanese immigrants creating the dish much like the schwarma that they left behind in their homeland. Al pastor is made from pork, and is typically seasoned with pineapple, onion, achiote, and a mixture of dried chilies and spices. Like schwarma, it is cooked on a trompo just like the gyro sandwich meat that you find in Mediterranean restaurants. I’m a big fan of lingua (tongue). A lot of Gringos can’t get their palates past the notion that they are tasting something, that is tasting them back, but I can assure you that it is a delicacy. The meat, when properly prepared as it was in my tacos is very reminiscent to me of braised short ribs. I love carnitas, and make the dish quite often at my home. If you look up recipes, you’ll find about as many ways to prepare it, as there are sources on the Internet, but in simple terms it is pork that has been braised for hours with complimenting spices until it shreds apart. Many of these traditional taco fillings are great if you like to put meat in a crockpot before you leave the house, and have an awesome meal ready when you arrive home. The aroma welcomes you with a seductive potency. I’m not a huge soda guy, but when I go to a Mexican taqueria, I have to enjoy my humble street food with Jarritos soda. My favorite is tamarind, which is the fruit from a seed pod that is widely used across Latin American and Asia. You know you’re in a traditional taqueria when there is a bar with several different types of salsa, pico de gallo, chopped onions, cilantro, lime wedges, pickled onions with habanero, etc. All of the toppings add flavor, texture and color to these already remarkable packages of joy. 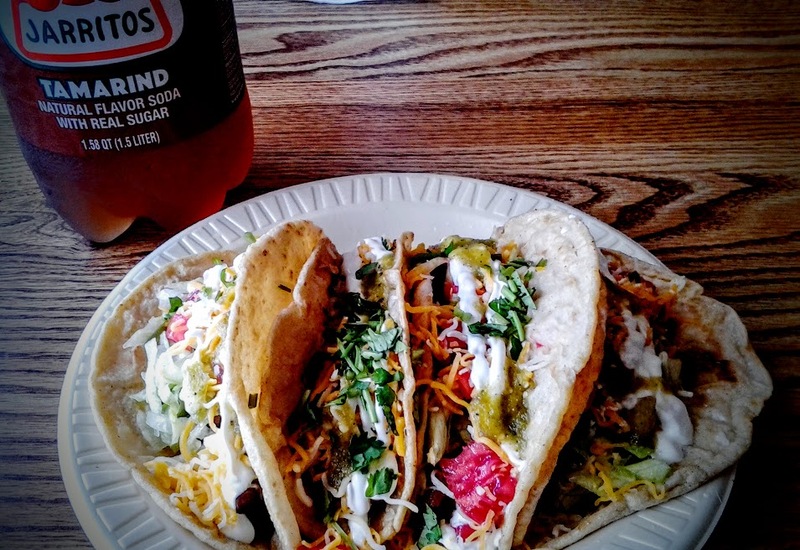 Tacos Jalisco is nothing fancy, but the focus is on the food, and they do it really well. The owners are some of the nicest, most gracious couples that you’ll ever meet. Give it a try!